Inder Loves Folk Art: Citronille "Guillemette." Have you heard of Citronille patterns? It is a line of (mostly) children's sewing patterns. Gorgeous, old-fashioned, and very French. As in, the instructions are in French. This is the Guillemette blouse. Just a simple peasant blouse/tunic style. I have some beautiful Liberty lawn, which I was thinking of turning into a peasant blouse for Maggie, but I decided to make a trial version first. This fabric might look familiar to long-time followers of the blog. 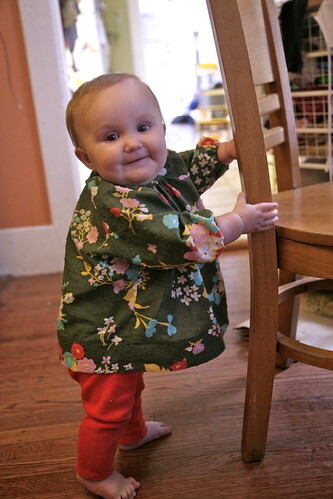 I made a dress from it when Joe was a toddler. It is a soft, light, swiss dot in a dark green print. To me, it has a bit of an old-lady-curtains vibe. Which I happen to love. The main change I made was to use elastic in the neckline instead of gathering and binding it in bias as the pattern calls for. You can't see it in these photos, but I used pink bias at the neckline and wrists, and pink hem facing at the hem. I love bias hem facing for curved hems. It is so much easier than trying to press a hem, and it looks polished and professional to boot. I just attached the bias hem facing, pressed it, and machine stitched it down. Because the facing is cut on the bias, it adapts itself to the shape of the hem (even a very curved hem), so there is no need to ease the hemline to fit, and there are no puckers. A little hot steam, pin, stitch, and done. Here, I was pleased with the longer length of the tunic without hemming, so it was especially perfect (and a good way of getting the most from a shorter length of fabric). This tunic is a practical piece. 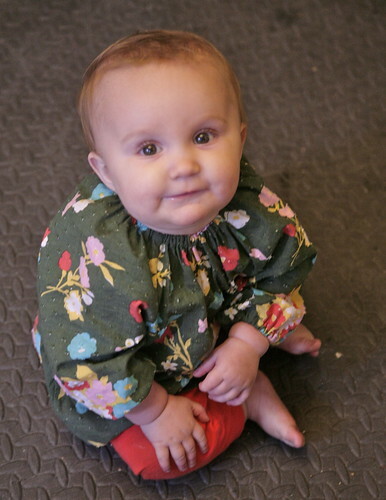 It looks great with leggings, but it's not so long that it gets in the way of crawling (longer tops and dresses make Maggie mad; baby girl needs to be able to get around). It's lightweight but gives a little coverage for cool ocean breezes. 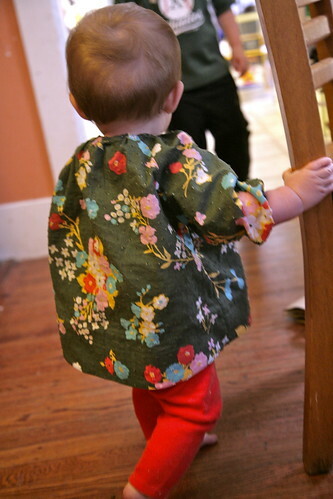 It would be very easy to make it short sleeved, or even sew it up in a knit, too. Nice basic cut. But while I think this blouse turned out really cute, I am not 150% in love with this pattern. For such a simple pattern, the fit is a bit weird - puffy all over, but strangely tight around the armpits (I shaved a little excess fabric off with my serger, which improved that issue but did not resolve it completely). Since ordering the pattern, I've read elswhere that Citronille sizing can be a bit wonky, and I am inclined to agree at this point (although it could just be this pattern, in this particular size). So, having made up this trial version, I decided that I would prefer to use the Liberty lawn for another Class Picnic Blouse. The fit, details, and finishing on the Class Picnic are impeccable. As usual, Oliver + s is just a step above the competition. 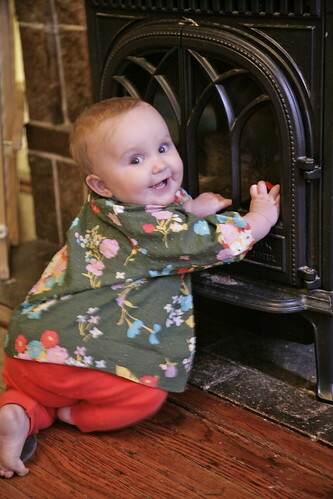 And I think that the little yoke will really help show off the beautiful Liberty fabric. For such precious fabric, I would rather use a slightly more precise and well drafted pattern. English instructions are also a plus. And this is why, when considering how to use your gorgeous but pricey Liberty, it is always good to make a trial version in beautiful, but not-so-precious fabric that has been sitting in your stash for years! I do love this little blouse, it is a very easy and fun way to use small amounts of pretty fabric, and I have a feeling this won't be the last one I make. C'est si bon! It is sweet on Maggie - love the fabric. Maggie is so gorgeous Inder! The blouse looks sweet but I know what you mean about a strange fit bugging you. I've often looked at Citronelle patterns but never bought. Looking forward to seeing the picnic blouse. Love it! Love how you manage to sew your kids clothes with all you have going on too! I think I'll stick with O+S for now, and i only have one of their patterns (so far, though I have my eye on the skort pattern) and still haven't made it up. Part of it may be the need to trace the pattern off as I don't want to cut it out of the original and ruin the rest of the sizes!